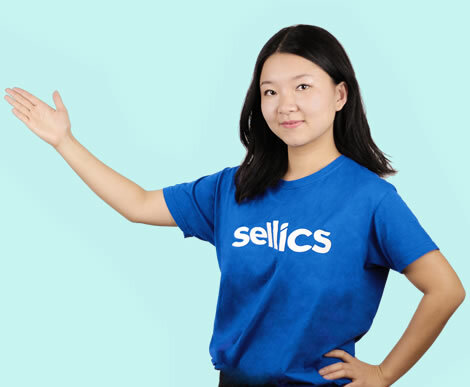 Content Marketing Manager at Sellics. I'm a storyteller and digital marketer looking at everything that's happening and changing in the Amazon marketplace. To run successful Amazon Sponsored Products campaigns, you first need to invest some time to understand the basic controls. Only once you know how they work, what their advantages and disadvantages are, and what they are used for, you can make the most of them. This article covers the basics of Amazon PPC and walks you through the key concepts and terminology. CPC bids and their control are explained separately in the lesson: Sponsored Products Optimization and this article. In short, search terms are what a customer types into a search field. Keywords are the terms that a seller bids on. Sponsored Product ads are displayed when a customer types a search term into Amazon’s search engine. Sellers use keywords to control which search terms will trigger an appearance of their ad. If the seller’s keyword and the customer’s search term match up well, the ad will be displayed in Amazon’s search results or the product listing. It is important to understand that search terms and keywords do not always have to be identical. This may sound strange — after all, as a seller, you are paying for a keyword and want to be seen when a customer searches for it. It makes sense, though, that keywords and search terms can differ. If, for example, the customer makes a spelling mistake and enters “walllet” instead of “wallet”, Amazon will still play out the ad of the seller bidding on “wallet”. In this case, the keyword is “wallet”, and the search term is “walllet”. In addition, as a seller, you can take control of the matching process by using the so-called “Match Types”. Match Types define how close the match between keyword and search term must be for an ad to appear. They control how many different search terms may trigger an ad per keyword. Broad: Search term contains all components of the keyword in any order. Phrase: Search term contains all components of the keyword in the same order. Note: If a keyword consists of only one word, the match types Broad and Phrase cover the same search terms because there is no word order. It’s important to understand that there is no “optimal” match type. Each match type has its pros and cons. The trick is to leverage the advantages offered by the individual match types, and learn to combine them to improve the precision of your ad targeting. In short, the Broad match type will give you the widest coverage of search terms for your keyword, with minor campaign monitoring required on your part. The downside is that you sacrifice ad targeting precision. Closer match types involve more effort but allow more precise control. The following table summarizes and compares all the pros and cons of the Broad and Exact match types. The match type Phrase is not listed in the table. It settles in somewhere between Broad and Exact, however, as a slightly attenuated version of Broad, it is much closer to Broad than to Exact in all its advantages and disadvantages. A retailer sells a large black wallet made of genuine leather. He is faced with the choice of using keywords with match type Broad or Exact to promote his product. Once again it is clear that broad keywords (A) require fewer keywords overall to cover a set of different search terms. The effort to research and control the keywords is, therefore, less than with many exact keywords (B). At the same time, the control with broad keywords (A) is also less precise than with exact keywords (B) — irrelevant search terms (marked red) are also covered. The search term “nylon wallet men”, for example, does not match the product because the wallet is made of leather. If you work with exact keywords (B), you can avoid this by only bidding on suitable keywords. In addition, with broad keywords (A), you can only use one general bid for all search terms. With exact keywords (B), you can differentiate the bid according to cost, conversion rate etc. to get the optimum out of each keyword. Negative Exact: Search term matches the negative keyword word for word. Negative Phrase: Search term contains all components of the negative keyword in the same order. Note: If the negative keyword consists of only one word, the match type Negative Phrase excludes all search terms that contain the keyword because there is no word order. As before, very similar variants are excluded with negative match types, e.g. Negative keywords can only be added for campaigns, not for individual keywords. The exclusion of the search term, therefore, applies to all advertisements (products) in the respective campaign. In this example, the negative exact keyword “wallet small” excludes only the exact search term “wallet small”. If instead, the negative match type Phrase is used, then all search terms containing the phrase “wallet small” are excluded (e.g. “wallet small”, “wallet small men”, and “black wallet small”). The search term “small wallet men”, for example, is not excluded as it has a different word order. To also exclude this search term, you could use the negative keyword “small” with the match type Phrase instead of “wallet small”. What are negative keywords good for? Automatic campaigns, as well as keywords with the match types Broad or Phrase, are prone to yield a) irrelevant search terms or b) relevant, but permanently cost-prohibitive search terms. By setting negative keywords, you exclude these unwanted search terms and reduce the cost of the campaign. Negative keywords are, therefore, a crucial instrument that can make the difference between a profitable and an unprofitable campaign. Check the search terms of your campaigns regularly and use negative keywords if necessary. Which match type should I use for this? Negative Exact: Use this match type if you only want to exclude very specific search terms. For example, if a) individual search terms that are relevant but too cost-intensive, or b) word combinations that are individually relevant but less so when joined (e.g. the search term “leather black”, for a black leather wallet). Negative Phrase: This match type is suitable if you want to exclude all the search terms that contain certain words. This is especially useful for words that do not match the product (e.g. “red” as a negative phrase for a black wallet). 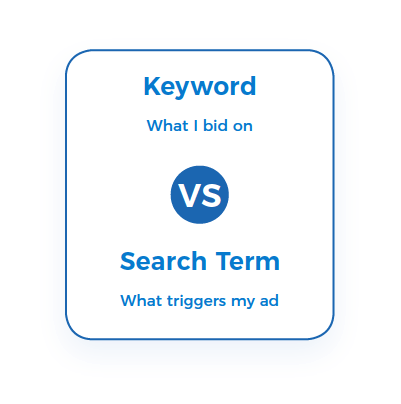 You might bid on the same keywords or search terms in different campaigns (e.g. if you have several similar products in stock). In this case, a particular search term could trigger a variety of ads from different ad groups and/or campaigns. When this happens, the impressions are usually distributed across the various campaigns. To bundle the impressions for a particular campaign, you can use negative keywords in the other campaign — the one that should not receive any traffic. There are two types of Sponsored Product campaigns: automatic and manual. Keywords: In manual campaigns, you can define a set of keywords to determine exactly which search terms should trigger your ads. In automatic campaigns, on the other hand, Amazon decides independently which search terms cause the ads to appear. To do so, Amazon orients itself on the keywords contained in the article information (title, bullet points, and general keywords). 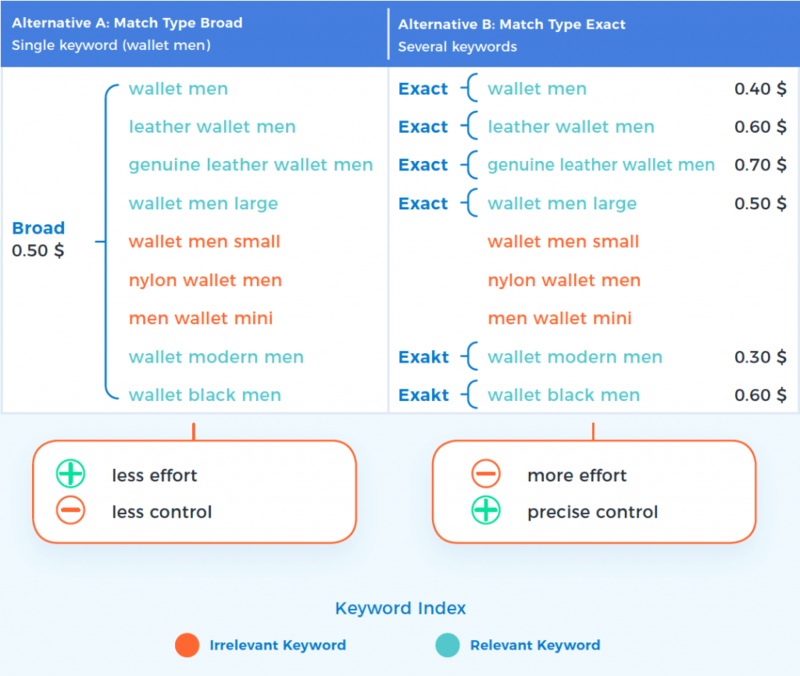 Keyword match types: Match types (Exact, Phrase, Broad) can only be used in manual campaigns. Negative keywords: Negative keywords can be defined in both automatic and manual campaigns. Keyword specific bids: Only in manual campaigns — Separate bids for each keyword to optimize costs and revenues for that keyword. The basic difference between the two campaign types is that manual campaigns can be controlled much more precisely. 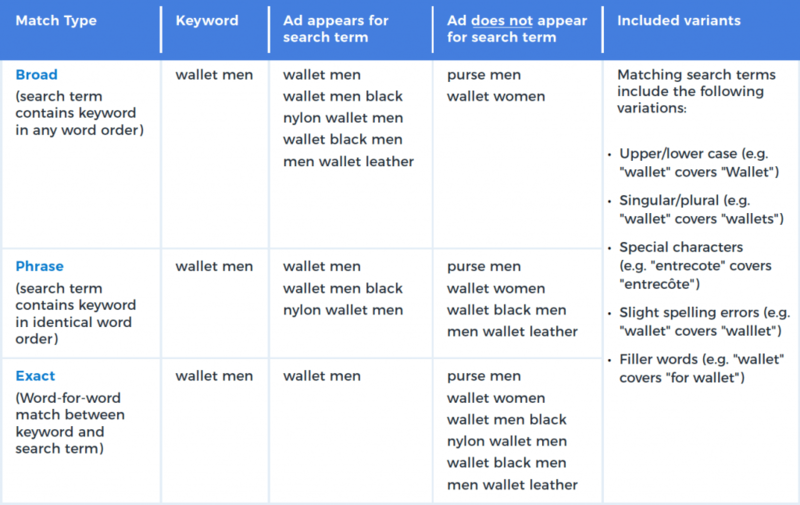 In contrast to automatic campaigns, it is possible to define the exact keywords for which ads should appear as well as the click prices to bid on for the individual keywords. In this way, you can prevent unnecessary costs due to irrelevant keywords. You can also reach the maximum profitability of relevant keywords with a more precise optimization. More precise control options, however, also mean more effort. For manual campaigns, therefore, you need to budget for a higher control effort than for automatic campaigns. Since Amazon selects the keywords in automatic campaigns, these keywords can also be used for keyword research. Combine the two campaign types to take advantage of both. Use the automatic campaign to research keywords. Then transfer any new, high-performance keywords that the automatic campaign identified to a manual campaign. Here, you can optimize them with better control options (match types, keyword-specific bids, and negative keywords) for maximum profitability. This strategy combines the best of both worlds. Important: the daily budget is an average value. 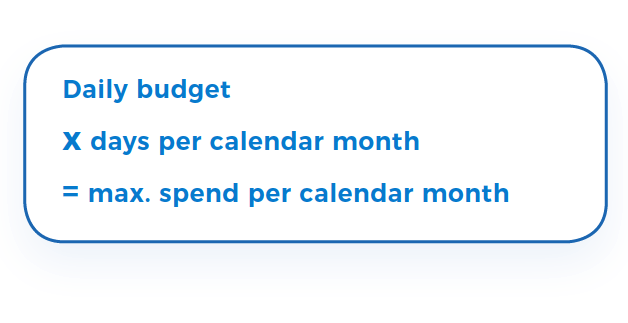 If the daily budget is not used up in one day, the unused budget is added to the following days. In this case, the daily expenditures on the following days can exceed the daily budget. A campaign starts on 06 January with a daily budget of $10. There are 26 days left in the month, so a maximum of $260 can be spent until the end of the month. Only $8 is spent on the first day. The leftover $2 is added to the budget of the next day, so that the maximum budget for 07 January is $12. The ad spend on 07 January can, therefore, e.g. reach $11. What Can I Use Amazon PPC Budget Settings For? Profitable campaigns: As long as a campaign is profitable and further spending continues to result in profit, it should not be limited by a budget. In this case, a budget that stops spending means lost profits. Unprofitable campaigns: Budgets are not the right starting point to improve the profitability of campaigns. To achieve this goal, campaigns should be optimized through efficient structuring, bidding, negative keywords, match types, etc. Despite these principles, a budget can be useful as a cost airbag, i.e. as general protection against excessive costs or errors (e.g. bidding too high by mistake). How much should I allocate to a budget as a cost airbag? Unprofitable campaigns: Set the maximum budget you are willing to spend until you have improved the performance of the campaign with an optimization process, or until the campaign is discontinued. At the start of a campaign, it is unclear how much it will cost. A budget of 10 € per advertised ASIN is, however, a good starting estimate to receive sufficient traffic without excessive costs. This budget can then be adjusted in due course. You should, for example, increase the budget if, after a few days, you find out that the campaign is very profitable, but the entire budget is regularly used up by midday. If fixed marketing budgets can be spent on sponsored product campaigns, PPC budgets are useful to limit the total spend on sponsored products and to distribute this spend between campaigns. 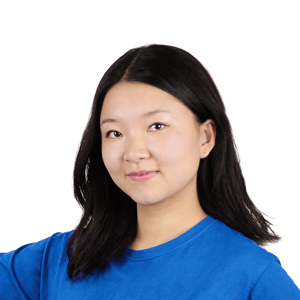 For partial periods within a calendar month or individual days, however, no fixed amounts can be defined with campaign budgets, since these are only average values, as explained above. Distribute the total spend of fixed advertising budgets to certain product groups, brands, and so on. 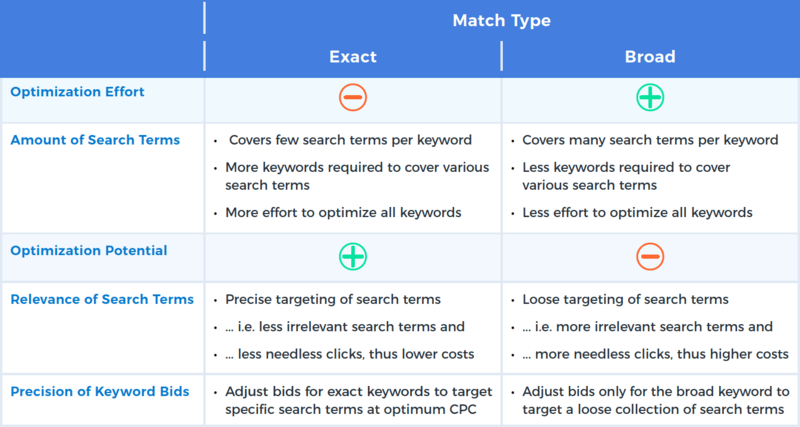 As you can see from this article, choosing the right match type or campaign type or deciding how intensively to use negative keywords are generally choices between effort and accuracy. Your appropriate controls depend on how much time you have and how ambitious your goals are. 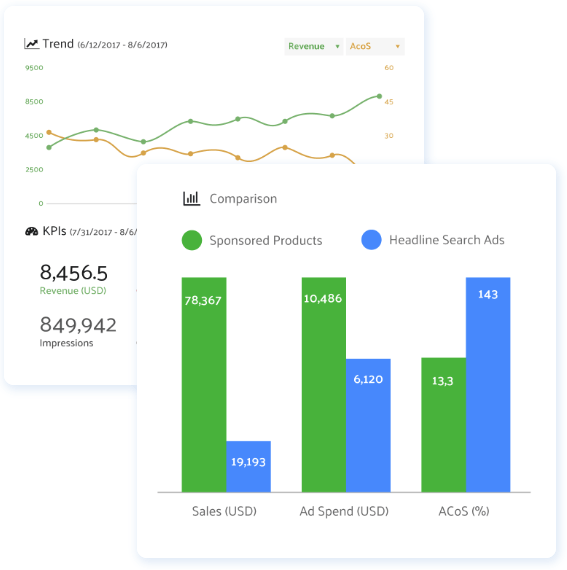 Analyze, optimize, and manage Sponsored Products and Sponsored Brands (previously Headline Search Ads) campaigns with the AMS Module in Sellics Vendor Edition. Maximum success with Amazon PPC campaigns- it’s never been easier! PPC automation: Save time with automated bidding. Managing keyword bids manually can be very time-consuming. Sellics automates these tasks for you and saves you a lot of time. See your KPIs and ad performance: Get an immediate bird’s eye view of your PPC performance. Compare your Sponsored Products vs. Sponsored Brands campaign performance with ease. Intuitive trend visualization: Understand how your PPC performance develops over time. Visualize and easily evaluate past campaign performance with our Trend Chart. Smooth workflow for campaign management: Full integration with AMS. Create and optimize your campaigns easily with Sellics. Efficiently handle bulk changes to campaigns, move keywords between campaigns, use negative keywords, and more. See your PPC history log: Changes you make to your keyword bids, budgets, added or removed keywords are all visualized for you. Learn from the past and know exactly which changes correlated with a boost in ad performance. Evaluate whether you are already making optimal use of the basic controls of Sponsored Products.